The French settled there in the first half of the 19th century, while in the 20th century, it has become a popular tourist destination where 22,000 square kilometres of pure delight just north of Montreal awaits you. Discover the beauty of Mont Tremblant in the Laurentians Mountains For those that want to take in the spectacular view from the top of Tremblant, this excursion will take you to the magnificent countryside of the Laurentians, where montains, lakes and forests abound. Our trip will take us to the famous Temblant Village, named the best ski resort in the East. 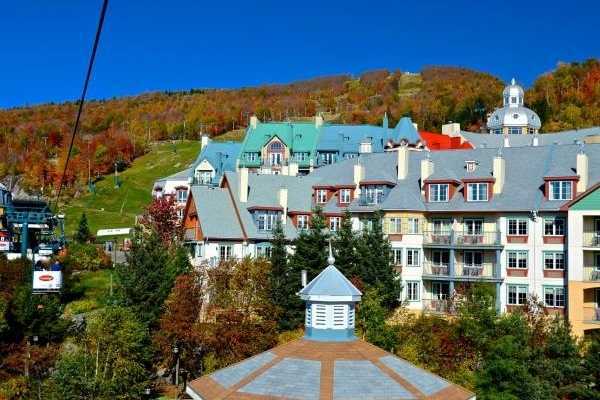 Our destination, Mont Tremblant, will include free time to explore the villages as well as going up the mountain for those that which to take in the magnificient overview of the Laurentians. A stop can be made in Val David, well known for its typical Quebecois breakfast. Opened in 1945, we'll eat in the oldest restaurant of the Laurentians, which has been entirely renovated since. You'll be able to eat a true sugarshack menu and sample maple taffee on snow, even in the summer! You’ll be seduced by the Laurentians’ breathtaking panoramas, speckled with mountainside cottages and lakeside villages. If you choose to ride the panoramic gondola to the top of Mont Tremblant, the highest peak in the Laurentians, you will discover a spectacular view of the Laurentians. The best time to visit this area is in the fall, when the maple trees change color, mixing hues of yellow, red, orange and green. Don’t miss this spectacular excursion.